Professional heroes kill and loot deadly monsters every day, but Gorm Ingerson's quest will be anything but business as usual. Orconomics skewers corporate culture using the best fantasy traditions. Fantasy fans, economics professors, gamers, and readers love Pike's blend of humor and epic storytelling. Professional heroics drives the economy of Arth, a world much like our own but with more magic and fewer vowels. For ages, it was ravaged by war and darkness, until the Heroes' Guild arose to drive back the forces of evil and reclaim the lost treasures of the ages of legends. Whenever a citizen or town is threatened, they need only issue a quest and rely a party of licensed heroes to come and slay the beast. At least, that's what the guild's brochure says. Today, professional heroics is the largest and most powerful industry on Arth. Shares of hoards are bought and sold on the market while professional heroes are contracted to slay the foe and retrieve its treasure. Brokers bundle the shares of looting rights into plunder funds, which are then divided up and purchased by hedge funds and investment banks. Nobody can quite be sure who owns what, but it's all very lucrative. In desperation to escape guild heroes, many Orcs, Goblins, Gnolls, and other Shadowkin have applied to become noncombatant paper carriers, or NPCs. But life is hard for NPCs. Their noncombatant papers can be revoked for even minor legal infractions, leaving them open to Guild retribution. And job opportunities for Shadowkin are usually limited to low-paying and dangerous work. Things are so bad that most Kobolds would kill for a job as a handbag performer. It’s easy to be cynical in place like Arth, and ex-hero-turned-vagabond Gorm Ingerson is as cynical as they come. But when the Dwarf reluctantly helps a Goblin in danger, he puts himself on a collision course with profit margins and prophecy. Now Gorm and his party of misfit heroes find themselves on the biggest quest of their lives. If they can overcome corporate greed and ancient evils, they just might save a world Gorm thought beyond redemption. 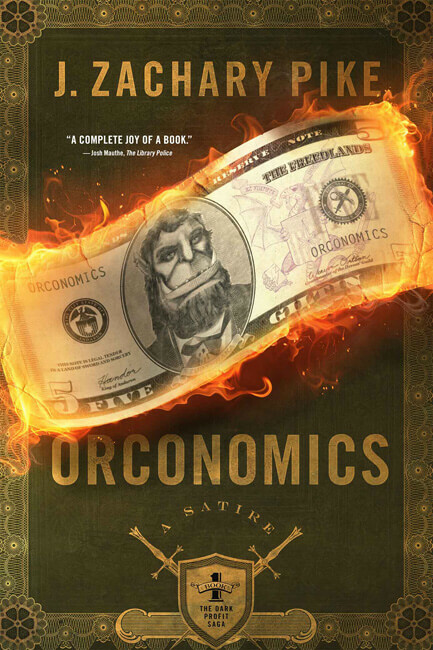 Filled with fun, fantasy, and financial calamity, J. Zachary Pike's Orconomics: A Satire is the first book in The Dark Profit Saga, an economically epic trilogy. Get it in paperback or on your favorite eReader today. Adventure awaits! Also, lots of trees await. But mostly adventure. Not geeky enough yet? Read the author's blog for irregular lore posts. Get (roughly) monthly updates, and a free eBook just for signing up. Illustrations on this page by Ørjan Ruttenborg Svendsen. Icons by Creative Stall, Cédric Villain, and Mateo Zlatar via the Noun Project.